Famous for its two championship golf courses, The Royal and The Ocean, the exclusive resort of Vale de Lobo has a picturesque setting amongst pine forests which lead to the sea. Famous for its two championship golf courses, The Royal and The Ocean, the exclusive resort of Vale do Lobo has a picturesque setting amongst pine forests which lead to the sea. Other sporting facilities are plentiful in Vale do Lobo, and include tennis and horse riding. Those looking for a more laid-back holiday will love the two kilometres of glorious sandy beach, as well as the fine dining options available in the many restaurants in Vale do Lobo. The nearby resort of Quinta da Lago can be reached within a five minute drive. Vale do Lobo boasts two top class golf courses The Ocean Course and The Royal Course both taking players through umbrella pine and fig tree-lined fairways to the Atlantic, the Royal playing dramatically along the cliff’s edge. Both courses provide an enjoyable game for golfers of all different standards. 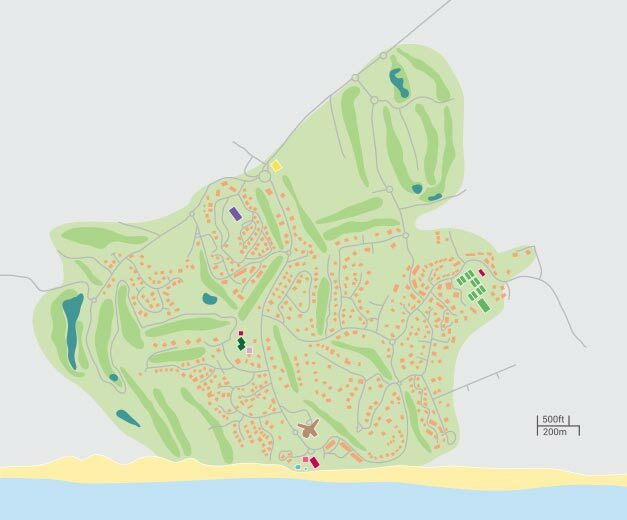 As suggested by its name the Ocean golf course is located with sandy fairways running along the nature reserve before leading gently down to the shores of the Atlantic. The Ocean Course at Vale Do Lobo is situated right on the very edge of the coast line and offers some of the most stunning views in European golf. Dress code Players are required to follow the regulations with regard to the dress code. It is essential that golfers wear golf shoes with soft spikes, as well as collared shirts and golf trousers or tailored shorts. The Vale do Lobo Royal golf course is a remarkable championship course with breath-taking views. The course is surrounded by wild flowers, leading unsuspecting golfers to its pièce de résistance: the 16th hole. The Royal offers players of all abilities an unforgettable golf experience. Vale do Lobo offers of the largest tennis facilities in the Algarve and Portugal. It attracts players from all over the world for national and international tennis fixtures, including an annual ATP seniors tour competition. At the Vale do Lobo tennis club you will also find a gym, swimming pool, pro shop and two restaurants overlooking the courts. Approximately €32 an hour to hire a court. On the 24th and 31st December the gym closes at 1pm and on the 25th December and 1st January the gym will be closed all day. Vale do Lobo offers a state-of-the-art gym with all the facilities you could need along with friendly and highly trained dedicated staff. There is also a range of classes available. Approximately €20 per person per day (or €33 for a couple). Approximately €55 per person per week (or €93 for a couple). Personal Training from approximately €50 per session. Use of facilities such as, mini golf, football and yoga. The Kangaroo Club at Vale do Lobo is a superb kids club for children who want to have fun with children of a similar age. With its 2000m² of enclosed grounds, The Kangaroo Club is a totally safe and fun-filled area specially dedicated to children aged 6 months up to 12 years old. The Kangaroo Club offers kids their own playing paradise, the wonders of new and educational experiences and the chance to make new friendships! Open between 12th April - 3rd November, and also 19th December - 5th January. Opening times vary depending on time of year, but always open at 9:30am until 7pm. Times are subject to change. Prices range from approximately €12 per hour per child (Aged 3-12yrs), to €35 for 1/2 day (without lunch), €43 1/2 day (with lunch), €65 for a full day and €285 for 5 days. For Infants aged between 6-36 months, prices range from approximately €14 per hour per infant, to €43 for 1/2 day (without lunch), €50 1/2 day (with lunch), €90 for a full day and €380 for 5 days. The Vale do Lobo Royal Spa offers a number of soothing treatments, The Spa´s aim is to provide ultimate relaxation. If you're looking for a change of scenery, why not pay a visit to the 'Rotunda' swimming pool at Vale do Lobo, which overlooks the beach. This large, circular pool is a great place to cool off in the sunshine and meet other people. There is a local charge to access the pool. Open from June to September however opening times are subject to change. Approximately €15 per adult per day and €7.50 per child per day. Vale do Lobo Algarve has plenty of restaurants, where diners can enjoy international cuisine ranging from Asian to French, Italian to Portuguese and sumptuous seafood specialities - the choice is extensive. This Pizza, Pasta restaurant is a must for sophisticated dining in the Algarve, Amore’s colourful dining room and vibrant outdoor terraces never fail to leave a lasting impression. Located on Vale do Lobo beach the beach bar is perfect for light lunches, refreshing drinks and sitting back to enjoy the Algarve sun. Breeze Papagaio, Located on the upper deck at Praça offers the world’s finest champagnes to pool-side sunbathers and sophisticated socialisers complemented by the sizzling flavours of the tapas from “Texture” or some fresh Oysters, there really is no better way to delve into the luxury of the moment in the Algarve. Breeze Poolside bar is located on the upper deck of the swimming pool complex in Vale do Lobo, here you can find light lunches, tasty snacks and refreshing drinks. A true taste of Mexico with a fresh, vibrant and modern feel. Sit back, relax and enjoy a cocktail from the wide selection on offer in the bar area of Cantina del Lobo. La Terraza restaurant, where you’ll find a host of family favourites - a taste of Italy in the heart of the Algarve. Founded by The late Ken Lo, author of over 30 books on Chinese cuisine, Ken Lo's Memories of China offers refined and relaxing ambience and includes a magnificent terrace overlooking Tennis Valley. Teahouse offers an eclectic menu that features the best in culinary experiences from Japan, Thailand, Indonesia, Singapore, Hong Kong and Vietnam, all prepared and served as appropriate to tradition. This popular bar and nightclub located in the ideal setting by the beach attracts both residents and holidaymakers with its modern relaxed setting. Gecko club guarantees for a fun night of dancing. A treat for fish lovers and those who enjoy fine dining in an stunning location, Sandbanks Fish and Seafood restaurant is the perfect spot to enjoy an evening meal with a view. Supermarket open 8:00am – 8::30pm Monday - Sunday, the supermarket is located at the entrance of the Vale do Lobo Resort. Vale do Lobo offers its own on site supermarket along with a newsagent, Soares Wine & Gourmet and a selection on specialised sports shops. With two kilometres of golden sand, vale do lobo beach is the ideal location for long walks. It also provides a vast Sports and Leisure offer such as nautical sports, golf, tennis, among others, in a pleasant space between pine trees and with gardened zones. It is a lovely villa in a great location. Villa was spotless but small things spoilt the experience. Villa was lovely a few little things to be fixed ,but nothing major hottub area very tired looking, cover needs replacing, but a lovely area very peaceful. The villa itself was superb with everything you could want for your comfort. My only observation was that there are the most beautiful trees out in the garden which are so huge that the pool was in shade from about 3pm which cut out the pleasure of swimming in the sun from that time. The level of the water in the pool dropped by a foot or so one day so the pump had to be mended, which it was, the next day. We did mention it to the rep and she did offer us another villa but we were happy to stay regardless of the shade issue. An excellent villa and perfectly located. The biggest praise we could give is, when we return to Portugal, it will be to this villa.